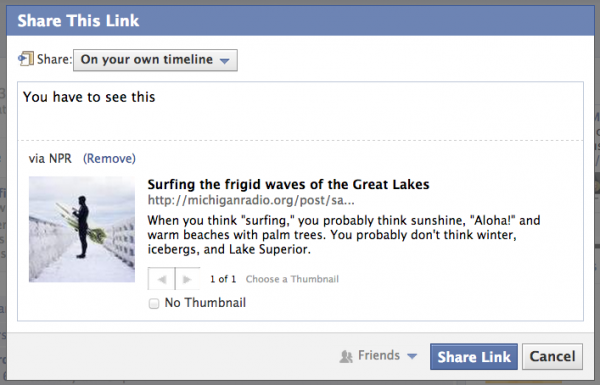 Writing shareable local stories doesn’t have to be complicated. The Local Stories Project shows that the tactics to create shareable stories cross state lines (all the way from Alaska to D.C.). We asked some of the current station editors involved with the project to share their tips. Check out this Nieman Lab story for more information on the nine types of local stories that drive engagement. Think about that quick feeling you get when you first see something and think “Oh, cool,” KUNC’s Digital Media Manager Jim Hill said. Know where to find and follow the conversation around news as it happens in your community to discover new angles to cover. WBUR social media producer Nate Goldman uses this tactic in Boston to find interesting stories on sites such as Reddit, Facebook and Twitter. One of his favorite examples is from a November election when he spotted a tweet from a local reporter saying the state told the reporter it was “illegal” to post a photo of his marked ballot. People react to emotion online. Try to find the human part of every story, St. Louis Public Radio web producer Kelsey Proud said. Hone in on the most interesting part of the story, KPLU’s former Online Managing Editor Martha Kang said. “I think the key is finding the hook—the thing that’s unique to the story, be it a great quote, a strange detail—and putting that hook front and center,” Kang said. What are the topics and stories your community really cares about? Make sure to keep an eye on those, KTOO new media producer Heather Bryant said. In Juneau, the two hugely shareable topics are citizens’ relationship with the government and stories about the great outdoors. The station uses Twitter lists to keep an eye on dedicated legislature tweeters — but they also make sure to put down social media and head outside. Headlines and visuals are key, KUT online journalist Wells Dunbar pointed out. “Headlines are important. Super important,” Dunbar said. He brainstorms headlines in a separate Word doc until he gets the perfect fit. And if a story doesn’t have a visual? Forget it. Example: Why Was This Cake Decorated With a Zombie Ben Franklin Left on a Hyde Park Porch Overnight?